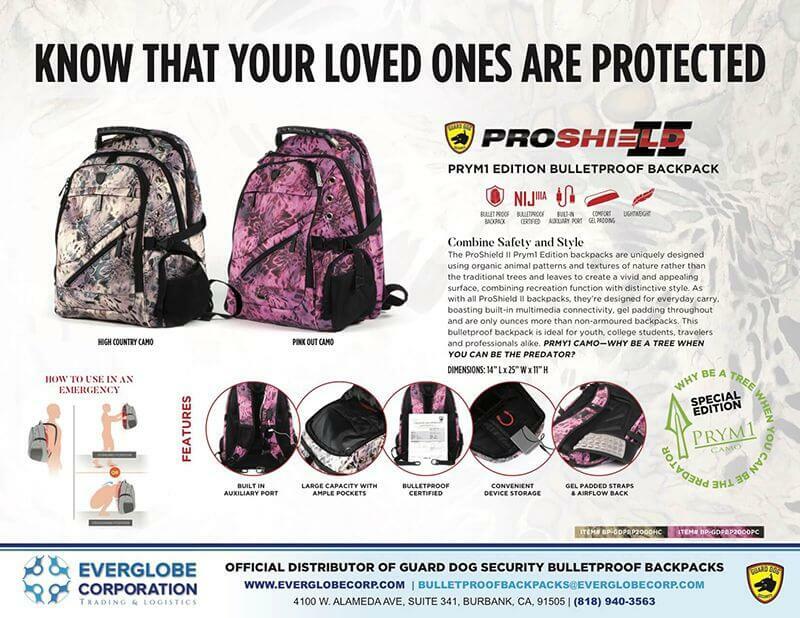 We are happy to announce that Everglobe Corporation is now the Official Wholesale Distributor of Guard Dog Tactical and Self-Defense Products in USA, Colombia, and Panama. 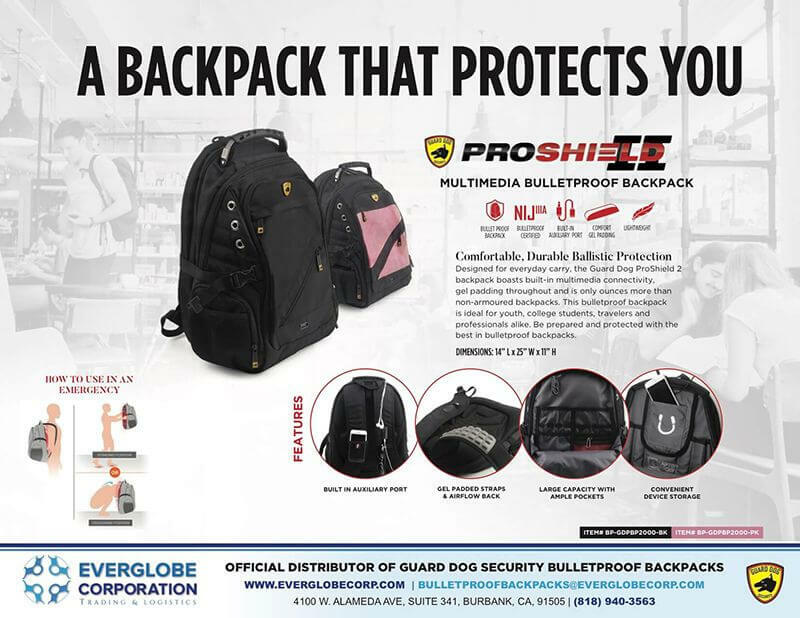 We are proud to showcase the new BulletProof Backpacks that meet the Ballistic Requirements for NIJ Level IIIA and comes in 4 model types and in various color and pattern schemes. All models are affordable, light-weight, weather-proof, multi-media functional, durable, and comes with ergonomic shoulder straps. Designed for everyday carry, ProShield 2 backpack is lightweight and boasts built-in multimedia connectivity, gel padding throughout and is only ounces more than non-armored backpacks. This backpack is ideal for youth, college students, travelers, and professionals alike. Crafted with detailed quality and features, the ProShield Smart includes a built-in charging bank to directly charge your mobile devices for all your on-the-go tech needs. Conveniently located on the adjustable strap is a hands-free smartphone holder that keeps your device on you at all times without falling at any angle. 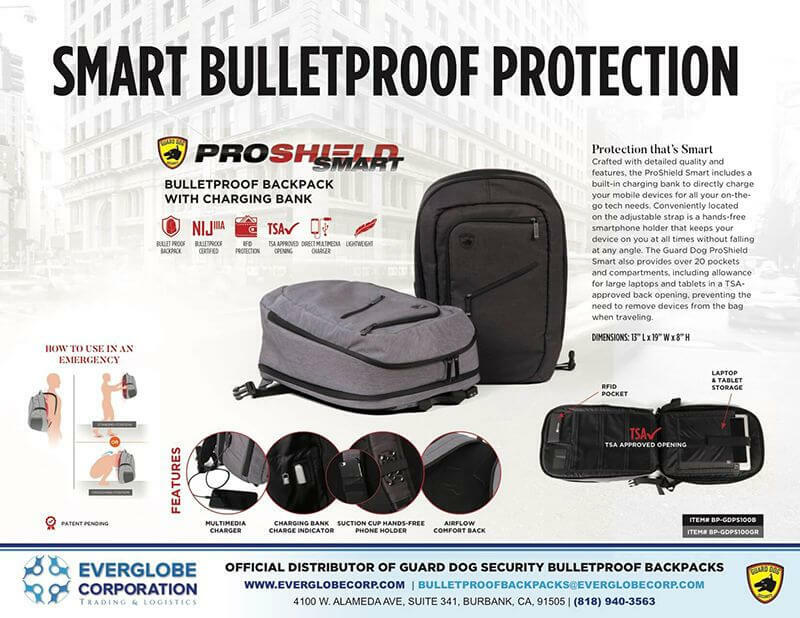 The Guard Dog ProShield Smart also provides over 20 pockets and compartments, including allowance for large laptops and tablets in a TSA-approved back opening, preventing the need to remove devices from the bag when traveling. Next to an easy-access ID holder is an RFID protection compartment, keeping your identity and valuable information safe and secure. The most sophisticated, finely designed backpack with bulletproof protection and wealth of functionality, the ProShield Pro is precisely designed from the bag to the pockets, zippers and compartments, the Pro provides comfort and convenience throughout for daily use with over 20 sleekly placed compartments, expandable laptop and tablet sleeves, an airflow back design, adjustable and padded straps and a handle that hides when not in use. ProShield Prym1 Edition backpack is uniquely designed with the professional concept of using organic animal patterns and textures of nature rather than the traditional trees and leaves to create a vivid and appealing 3D appearance on a 2D surface, combining recreation function with distinctive style. This lightweight backpack has over twenty organizational panels and pockets, including a tablet/laptop pocket and detachable key ring. Keeping up with today’s technology demands, a built-in auxiliary multimedia port extends from inside the backpack to the outside shoulder strap for music and hands-free phone usage. 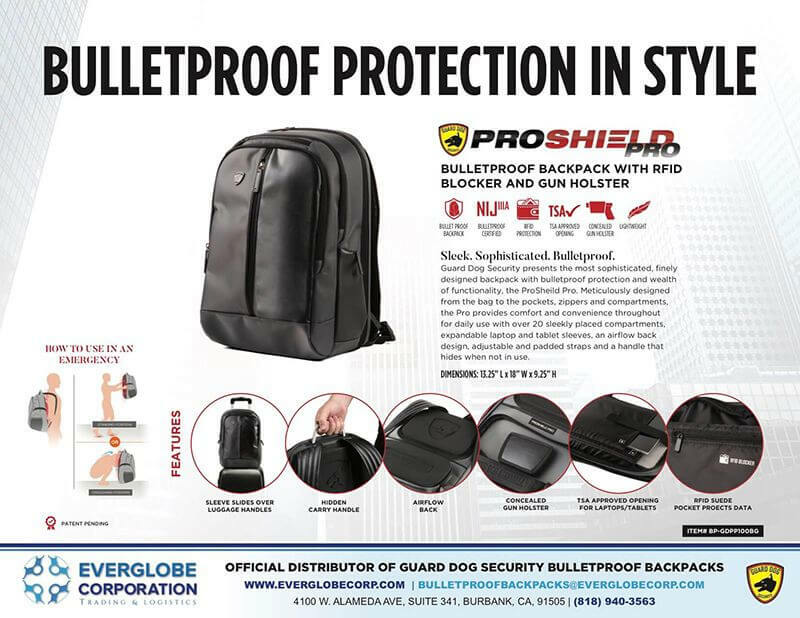 For wholesale pricing, please email us at bulletproofbackpacks@everglobecorp.com or we can be reached via phone at +1 818 940 3565 between the hours of 8:00am-5:00pm PST for further details. Thank you.